Listen up Rubik's Cube -- you're a cute toy. You've got a lot going for you. Bright colors, angular jawline, just the right amount of mystery. And you're even celebrating a birthday this month, 30 years, that's a heck of an achievement. You should have a really positive self-image. You've helped thousands of geeks impress thousands of girls and brought competition to those who were not that into sports. But sadly, despite a similar color palette and basic geometric design, you are no LEGO brick. In fact, a LEGO Mindstorms robot was even used to solve you recently, that's probably got to hurt. 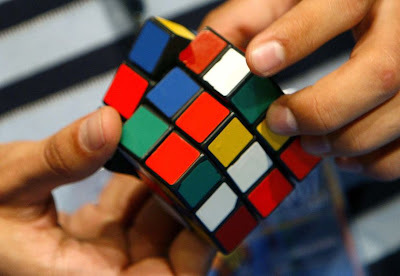 As far as I know, the Rubik's Cube isn't spontaneously compelling LEGO bricks together a la some sort of dork force field -- although I'll admit that would be pretty sweet if it happened. So take solace in the fact that you're still relevant. You could have been Crossfire, left behind when I was eight years old, despite the catchiest board game theme song of all time. It's simple. Rock always beats scissors, and bricks always beat cubes. Could this be the beginning of a LEGO art school?